The Lynnport Community Fire Company is a 100% volunteer department. We are located in the northwestern corner of Lehigh County, PA. Our coverage area is approx. 16 square miles and is primarily made up of farm land. Our department was founded in 1944 and had one truck, a 1944 Diamond T pumper. Today we are still located in that station although there have been several additions to the original station. We currently have 5 trucks, a 1993 3,500 gallon tanker (1421) which is the second largest tanker in Lehigh county, a 1998 Quantum Pierce Pumper (1411), a Brush truck (1461), a Pumper/Tanker (1412), and a QRS truck (1491). In addition to tradional fire protection we provide QRS, light rescue, and Ice/water rescue to our community. With mutual aid agreements with our neighboring communities of Kempton, New Tripoli, and Germansville. 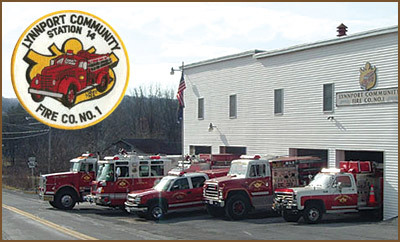 The Community Fire Company of New Tripoli, sometime referred to as simply, New Tripoli Fire Company, serves the residents of Lynn, Lowhill & Weisenberg townships in Lehigh County, Pennsylvania. We also provide mutual aid to our neighboring communities. 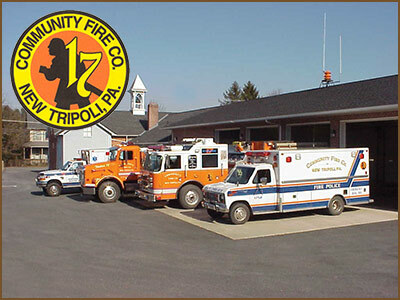 The New Tripoli Fire Company is a 100% volunteer fire company that was incorporated on May 24th, 1945. Currently we have 27 active volunteer firefighters. In addition to responding to emergencies we also have to hold fundraisers to raise money to support the every costs of running the fire company. Our funding sources include a yearly mailing campaign, various drawings, Block Shoots, Pie sales and support from the Ladies Auxiliary.